In a climate like ours in Savannah, Georgia, it can be great to have a space where you can enjoy the outdoors year round. However, as any homeowner with an outdoor patio knows, beautiful weather comes at a price. Harsh UV rays, pesky mosquitoes, and inclement weather are only a few of the things that can quickly spoil a gathering with friends and family. Fortunately, homeowners can turn to Porch Outfitters for beautiful, custom-built patio enclosures that allow them to enjoy the outdoors without any of the drawbacks. What Sets Porch Outfitters Apart? At Porch Outfitters, we are outdoor living specialists who have been building custom patio enclosures since 1987. We offer a wide variety of outdoor living products to meet the unique needs of our customers, including sunrooms from the trusted manufacturer TEMO. 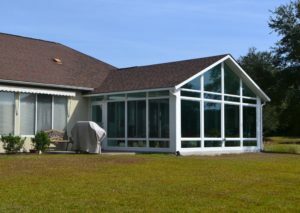 With glass walls, extruded aluminum supports, and other premium features, these sunrooms will expand the usable square footage of your home. We also offer screen rooms in custom configurations. And, we can meet the requirements of even the strictest homeowners’ associations by seamlessly blending your enclosure with the rest of your home. Additionally, Porch Outfitters goes the extra mile to ensure our customers are satisfied with their patio enclosures. We use our own employees – not subcontractors – who have been thoroughly trained and adhere to our high standards for quality workmanship. Plus, we offer a lifetime labor warranty, so you can rest easy knowing your investment is protected. Contact Porch Outfitters today to learn more about the styles of patio enclosures we can install at your home in Savannah, GA.